Wow, what a card: Let's take a moment to thank Fleer for this fine card. The effort and hard work that must have gone into such a fine representation of such a stellar pitcher is mind-blowing. Just think of the countless hours the photographer invested to capture such an important moment. 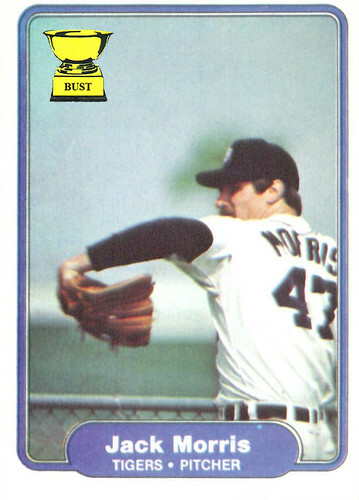 It's not just the artistic acumen required to present Morris in a grainy, out-of-focus image, it's the foresight to picture him not during a game, but throwing in front of a chain-link fence, apparently in a prison yard in southern Michigan. So bravo, Fleer executives, you've outdone yourselves once again.